Enjoy CONTEMPORARY LIVING in a HISTORIC LANDMARK! 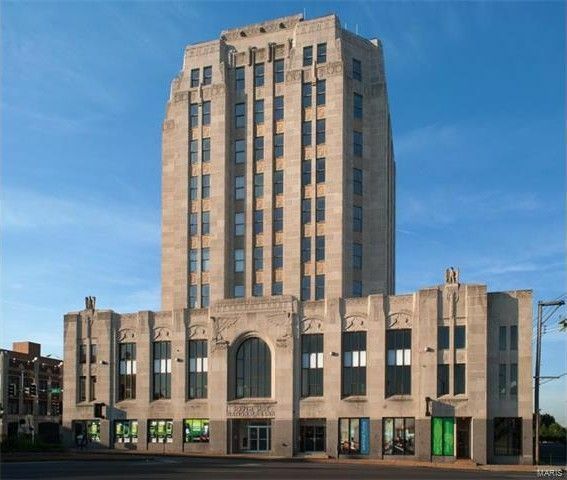 Originally home to South Side National Bank, this prominent ART DECO HIGHRISE, converted into 13 high-end condos in 2007 is just minutes away from South Grand's ethnic eateries, Soulard's nightlife, Tower Grove Park, Botanical Gardens, SLU, Wash U, hospitals & major hwys with quick access to downtown! This beautiful urban condo offers a spacious open floor plan with sleek modern lines & undeniable finish quality, 9ft ceilings, fabulous windows with tons of natural light & amazing city views! The gourmet kitchen boasts new stainless appliances, custom maple cabinetry & breakfast bar, perfect for entertaining! In-unit washer/dryer & luxury bath w/slate tile floor & chrome faucets. WATER, SEWER, TRASH & INSURANCE INCLUDED IN CONDO FEES! Building amenities include secured resident entry, newer elevator, high-speed internet available, gated resident parking, storage units & shared rooftop patio w/BBQ grill & awesome views of the Arch! Directions: From Hwys 64/40 or 44, take the Grand Blvd exit going south. The South Side Tower is located at the intersection of Grand and Gravois Ave. Guest Parking is available at the back. Enter through the Residential Entrance on west (back) side of building.